extended tours anywhere in Scotland. I have also run a very special wildlife tour to Poland most winters since 1985. Watch here for news of any future trip. I also cover (i.a.) 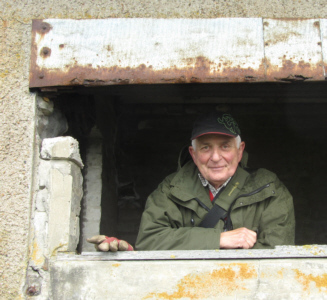 political and social history; basic geology; and daily life in contemporary Scotland. I am happy to lead moderate walks (up to 10 miles/1,000' of ascent; 16km/330 metres). Private tours for groups up to 3/4 are available in our Škoda Yeti. Costs on application. Fees - step-on guide: for guidance on level of fees I may charge as a step-on guide, see this page on the Highlands of Scotland Tour Guides Association website. (NB - I am no longer a member of HOSTGA.) Fluent English, workmanlike French. Some Dutch, Kiswahili, Latin, Polish. When speaking English to those who are not native speakers of the language, I speak slowly, separating my words. I carry comprehensive liability insurance. For more information on my background see this page, and my FaceBook page - click on icon to right. We do our utmost to keep this website 'clean' but would very much appreciate if you would let us know about dead URLs, also any other solecisms such as gramatikal erors, speling or sin tax mistakes, misplaced apostrophe's etc. Thank you! 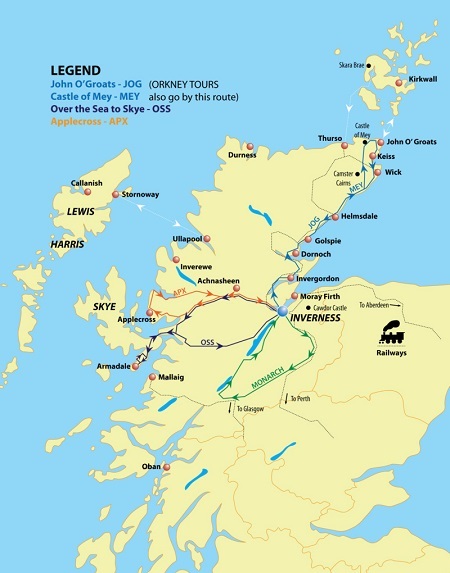 Puffin Express/GO-Orkney no longer offer any scheduled trips but we are pleased to advise you Highland Experience now operate day tours from Inverness (see map on right) to John o'Groats and Applecross similar to those which Puffin Express operated for a dozen years. I drive some tours for Highland Experience. The map to the right* shows the routes followed by Highland Experience's Applecross and John o'Groats tours. The map also shows the islands of Lewis and Orkney, to which HE offer multi-day tours, starting from Inverness or Edinburgh. Do not confuse HE's multi-day trips to Orkney with our private 1-day tours there, ex-Inverness. *The map is from Puffin Express's programme in 2010; the MONARCH and MEY routes shown are not operated by HE. Skye/John o'Groats/Loch Ness & Black Isle (4-day). Other combinations are also possible if you take time to explore the Scottish Tours website.